Crafted in classic 9ct yellow gold and featuring an intricate sparkle twist design, this stunning bangle is a charming blend of contemporary trends and vintage glamour. Wear with complementary jewellery for a coordinated finish, or contrast with bright jewellery. 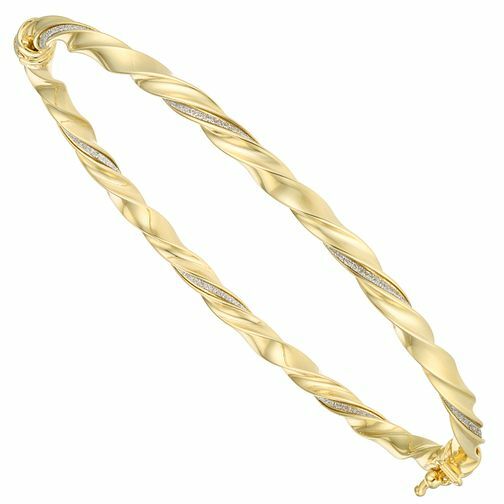 9ct Yellow Gold Sparkle Twist Bangle is rated 5.0 out of 5 by 1. Rated 5 out of 5 by Anonymous from Really lovely bracelet I bought this bracelet online to replace one I had for years but lost recently. Buying stuff online is dicey but this bracelet is very nice indeed and well worth the money. It was noticed when I wore it and much admired. Well done Ernest Jones.